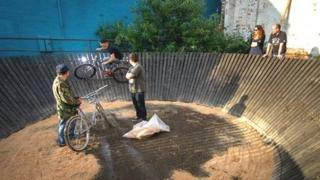 A cycling group in Northamptonshire has built a circus-inspired "wall of death" for bicycles. Inspired by the vintage attraction, the Bomberdrome was hand-built by a group called the Ministry of Bicycles (MoB). It cost £4,000 and took a month to build the 8m (26ft) structure. Bill Pollard, of the MoB, said: "I saw one that was built in the USA and thought 'we could do with one of those'." The Bomberdrome will be showcased at Wicksteed Park in Kettering on Saturday and Sunday, as part of the Wonderful Wheeled Weekend. Four 1980s Rally Bomber bicycles were custom built for the Bomberdrome. George Pollard, another member of the MoB team and Bill Pollard's brother said: "We tested it out for the first time the other night and it was really tricky to ride, but after a few hours we started to crack it. "It is such an adrenaline rush to cycle around it and it is an amazing spectacle to watch." The project is to be the subject of a documentary commissioned by Film Northants. Lily Canter, festival chair of Film Northants, said: " "We were looking for an unusual and eye-catching stunt to help celebrate our fifth anniversary when we heard about the Bomberdrome. "It seemed to be an excellent, eccentric event and we can't wait to see it in action at Wicksteed but also on the big screen at our awards night."